We are in CLC blcok machine manufacturing business along with our own CLC block Production. Any query related to CLC block Production or Failuer of Machine will be attended by our company. 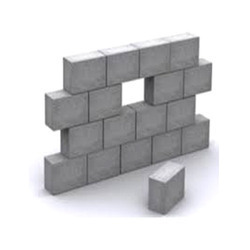 Rectangle Foam Concrete Blocks, Size: 24"x8"x4"
Bansal Building Materials (p) Ltd.
We are counted amongst reckoned names in the industry, committed towards trading and supplying a wide gamut of Light Weight Foam Concrete Block. Height: 200, 240 & 250 mm(8", 9.5"
This Cellular Light Weight Concrete Blocks are used in construction which is manufactured by us and can avail in all over the Gujarat state. We are looking for queries from Gujarat and Maharashtra only. As a client centric organization, we are providing a wide assortment of Foam Concrete Block.